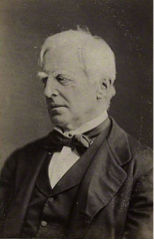 Robert Lowe Sherbrooke, properly known as the 1st Viscount Sherbrooke, was a highly respected 19th century British politician and member of the Privy Council who also wrote a good deal of poetry in his spare time. It is incredible that he achieved so much because he had very poor eyesight, a condition that may have been attributed to his albinism. His terms of high office included the posts of Chancellor of the Exchequer while Gladstone was Prime Minister and he followed this with a two year spell as Home Secretary. He also served with distinction as a statesman in Australia and had a system of electoral division named after him (the Division of Lowe). He was born on the 4th December 1811 in the Nottinghamshire town of Bingham. His father was the Rector of Bingham. Growing up an albino child his sight was very poor and it almost prevented him from attending school but, fortunately, it was just about adequate for lessons. He was educated locally at first before going on to Winchester school in 1825 where he endured a harsh regime common at that time in public schools. He thrived though and earned a place at University College, Oxford where he won a first class honours degree in the Classics in addition to a second class in Mathematics. He spent time at Magdalen college but left there when he got married. Lowe, his wife and two adopted children returned to England in 1850 and he soon became an in-demand writer, providing leader pages for The Times. He had lofty political ambitions though and secured a parliamentary seat in 1852. In the following years he served in a number of ministerial appointments, enhancing his reputation as he went along until finally, with the support of Prime Minister William Gladstone, he joined the peerage with the title Viscount Sherbrooke. His health, which had never been good, was failing during his final years. In 1884 a small collection of his poems was made public although they were never intended for publication. This was called Poems of a Life. Robert Lowe Sherbrooke died on the 27th July 1892 at his home in Warlingham, Surrey, at the age of 80.